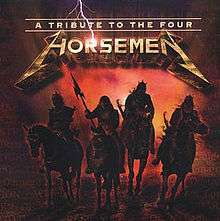 A Tribute to the Four Horsemen is a tribute album to Thrash metal band Metallica. It was re-issued by Nuclear Blast Records in 2003 with a slightly different track listing. The album contains covers of songs by Metallica from Kill 'Em All to ReLoad, but omits Load.